The parkway where Pope Francis will celebrate Mass will be able to hold about 250,000 of the million or more people organizers have projected will attend the service, a new estimate shows. The Secret Service told The Associated Press on Friday that about 80,000 people with tickets distributed mostly through local parishes and an online lottery will fill the first three blocks in front of the pope's altar for the mass Sept. 27. 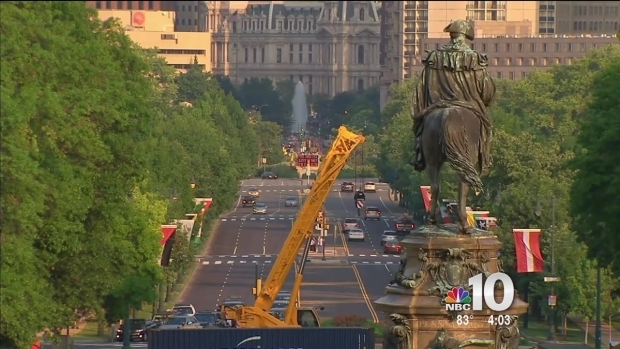 The rest of the mile-long Benjamin Franklin Parkway, stretching to City Hall and also within a secured perimeter, is projected to hold from 150,000 to 200,000, special agent David Beach said. Organizers expect more than 1 million people for the Mass and as many as 750,000 for a concert and festival featuring the pope the night before, also on the parkway. The pope will parade along the event grounds both days. Homeland Security visited Philadelphia Friday to meet with city leaders as they work to make sure Pope Francis and everyone visiting will be safe during his visit. NBC10’s Lauren Mayk reports how the city is preparing their safety measures. Secret Service Director Joseph Clancy said the Philadelphia leg of Francis' tour presented "enormous challenges" because, unlike in New York and Washington, D.C., all of his public events will be outdoors. City spokesman Mark McDonald said the new numbers are a roughly accurate estimate. The early estimate of 1 million plus expected for the papal mass never assumed everyone would be on the parkway "proper," said Ken Gavin, a spokesman for the Archdiocese of Philadelphia. The estimate also took into account overflow crowds to LOVE Park, around City Hall and on other streets, he said. McDonald said the rest of the pilgrims attending the festival and Mass will be able to stand outside the immediate, secured parkway area, watching on jumbo TV screens. He said those areas should be able to hold hundreds of thousands of people. Large screens also will be at other key locations in the city. The parkway is within the pope's innermost security perimeter, ringed with miles of security fencing and barricades. People entering must pass through airport-style metal detectors. That process, Beach said, could take two to three hours depending on when crowds arrive. "It's not getting them through the checkpoints," Beach said. "It's getting them to the checkpoints. They have to wade through all those non-ticketed people that are out there." Beach discussed the parkway capacity projections in an interview at the Multi-Agency Communication Center, a high-tech clearinghouse for the intake of law enforcement, public safety and crowd control information. Donna Crilley Farrell, executive director of the World Meeting of Families — the triennial Vatican-sponsored conference attracting Francis to Philadelphia — has called the parkway the best place in the U.S. to see Francis. "A huge part of this is the experience, is the pilgrims joining arms and singing and waving their flag, from Toledo, Ohio, and Toledo, Spain," Farrell said recently. "It's going to be the most joyful experience ever."